In Miami, A New Condo Boom Revives Hopes Of Housing Recovery At the height of the housing boom, condominium towers popped up on the Miami skyline faster than you'd believe. Once the market crashed, those towers sat vacant. Now, led by foreign buyers, condos are selling again as developers try new, more stringent financing rules. Brickell CityCentre is a new project that includes retail, offices and two condo towers. In all, some 19 condo towers are going up in downtown Miami, just seven years after the housing market crash. "Ultimately there will probably be about 25 to 30 towers, probably close to 12,000 units that are all going to be announced or are in the planning stages," he says. "But basically, South Florida is in the begging of its whole new condo boom all over again." Once again, much of downtown Miami is filled with construction equipment and workers. 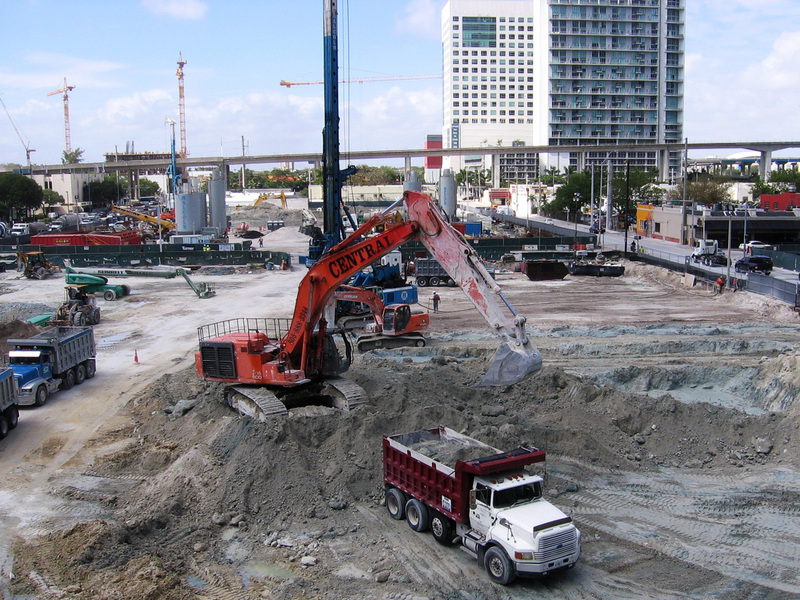 At the Brickell CityCentre project, excavators, augers, dump trucks and bulldozers are at work on a nine-acre site. It's the largest construction project under way in Florida. It's a mixed-use project that will include offices, retail space and at least two residential towers. Just blocks away, cranes are at work raising two other new residential projects. It's a remarkable comeback for developers and the construction industry in Miami, and there's one simple explanation: "Miami never lost its international appeal," says Stephen Owens, president of Swire, the developer working on the CityCentre project. Like most developers, Swire got some bruises when the last condo boom crashed. When the music stopped in 2008, there were 22,000 residential units for sale in Miami — an oversupply, Owens says, that many thought would last for decades. "And here we are," he says, "there are about 1,200 units of that original 22,000 that remain unsold. That says so much about the market." It's a market largely made up of foreign buyers — Latin Americans, Europeans, Russians — looking for a second home or an investment. When the market collapsed, those foreign buyers, mostly paying cash, snapped up many of the Miami condos at cut-rate prices. With foreign buyers in mind, developers in South Florida are now using a new financing model. They're requiring customers to put down 50 percent or more of the total cost before construction begins. It's the way residential projects have long been financed in Latin America, and with banks leery about financing new condos, it's now become the norm in Miami. That's how this condo boom in Miami differs from the last one. 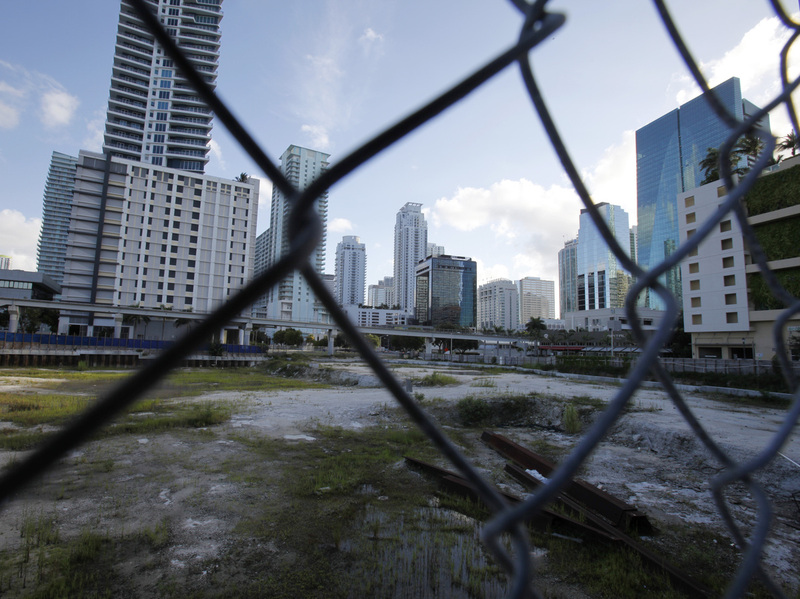 Development stopped and housing went unsold when the housing bubble in Miami popped. "It does very much take out the speculator," Owens says. "Even if there's a speculator out there, he's not going to tie up very many units at that level." With more money in the game, it's believed buyers will be less likely to walk away if the market turns down. And with many well-heeled foreign buyers ready to finance new condo projects throughout South Florida, developers are once again selling luxury living. At another new project, Marina Palms in North Miami, sales director Michael Internoscia takes customers through a just-completed sales center — complete with a model 2,100-square-foot, two-bedroom unit. He shows off imported Italian cabinetry used in the kitchen and bathroom, plus top-line appliances and a heated toilet and bidet, complete with a remote control. "Every detail was thought of when we designed the kitchens — knowing what people would want, knowing what upscale would be, kind of what a five-star residence should look like," Internoscia says. Aiming at an even more exclusive market, some developers in South Florida are selling ultra-luxury living — projects with car elevators and private pools on each terrace priced in the tens of millions. For now, it's a market made up almost entirely of international buyers. And for domestic buyers — used to traditional home financing — requiring a 50 to 80 percent down payment is a hard pill to swallow. But Anthony Burns, one of the developers of Marina Palms, says he thinks it's only a matter of time before this new boom convinces banks it may be safe to dip back into Miami's condo market. "They've been licking their wounds for a long time from the crash that happened down here in Miami," he says. "But nothing will get them back in the market faster than seeing the success stories of these first projects that are going up." If banks come back with financing and domestic buyers get back into the market, Miami's new condo rush could expand into the rest of Florida. This boom, developers say, is more sustainable than the last one, with better financial safeguards. But Burns says there's something else developers know: It's better to get in at the beginning of the boom than just before the bust.